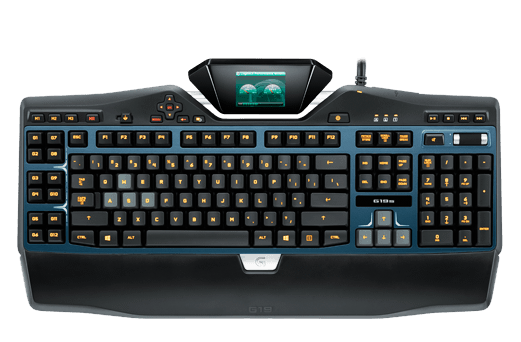 Mechanical key switches are the industry standard for gaming keyboards but there are still some keyboards coming out which include upgraded membrane switches, one of those is the Logitech G19s. Just like with other feature-rich keyboards such as the Mad Catz Strike 5, Logitech decided to put more money into adding features to the G19s instead of equipping it with mechanical keys. The inclusion of membrane keys immediately keeps some people from buying a keyboard, but there are others that like to have features such as a full LCD display and tons of switchable profiles. For those of you that enjoy having tons of features, the G19s is here to please. Included on the keyboard is an adjustable color LCD panel which can show profile and computer information as well as display YouTube videos. Even though watching a YouTube video on such a small screen might not seem like a beneficial thing, it can be helpful if you need to watch a game tutorial or walkthrough and you do not have a second monitor to otherwise play the game and watch the video. There are 16 millions different colors to choose from and a different color can be assigned to each profile that you setup and save onto the keyboard. It seems as though making a keyboard “for gamers” is a relatively loose phrase because there are many gamers that simply cannot and will not play a game unless they have mechanical keys. This fact alone is what really makes me question whether or not the Logitech G19s is worth the money. While there are some membrane keyboards that still have a good feel, the G19s’ keys are far to stiff resulting in a horrible typing experience. Playing games will generally be a little less demanding on the keys but if you are trying to execute a macro command, you could be in trouble due to the keys being very stiff and rigid. Outside of the keys, there was only one other major issue with the G19s and that is its cord. The G19s requires far more power than the average keyboard to the extent that the cord is very bulky and even requires AC power. Since finding a wall socket at a LAN party or other event can be difficult, requiring any sort of AC power is definitely a bad move in my opinion. Without a doubt, the inclusion of useful features such as the LCD screen, internal memory, and customizable backlight proves that Logitech had some good ideas when developing the G19s. Unfortunately a large portion of gamers and regular productivity-minded consumers will have a hard time using the keyboard due to its stiff membrane keys. If you are an avid gamer, the G19s might be a worthwhile investment as long as you do not need to use the keyboard for most of your commands.